A good and just government would bend over backward to spend less every year and extract its funds from non-citizens. However, our government is neither good nor just. It is out of control, dangerous and lethal. Out of control because there is no reeling it in. Dangerous because ti has its Gestapo police state backed by idiot legions. And lethal because admit it or not, the fed.gov is killing America (with help from the lawyers–Shakespeare was right he only got the result wrong). Overthrow is more likely than tax reform. No sane person would support any American politician for any position except prison. The fish does stink from the head down. Unfortunately, most of the proletariat are so Neaderthal that they don’t get it. As long as they have the NFL, beer and somebody’s wife to bang, they could care less about the health government or freedom. That is really a 43% flat tax rate when you include the employer portion and government revenue from the tax is not adjusted for high inflation. Imagine that, a Libertarian lying about the benefits of a flat tax. I am so shocked. 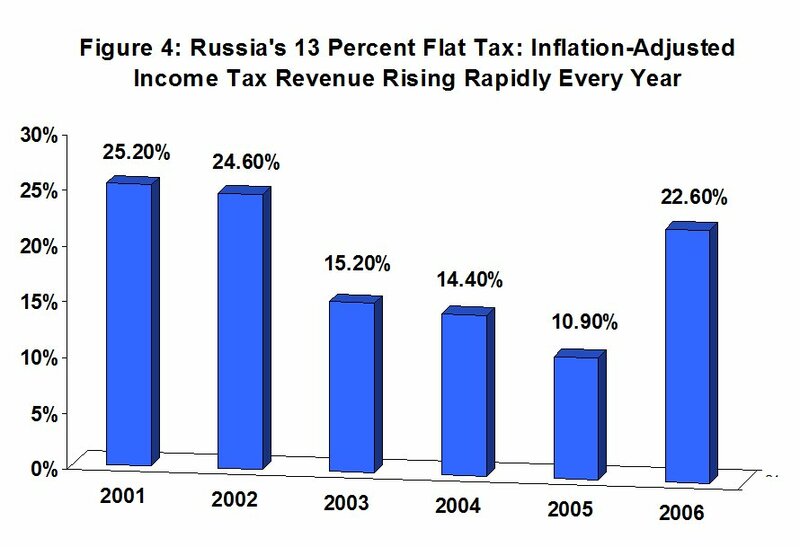 G’day Dan, this latest email about Russia’s flat tax success was the best thing I’ve read today. The timing is impeccable because FINALLY we have a politician here in Australia – Pauline Hanson – who today started advocating for a flat tax. Of course, the main argument her opponents are coming up with is the seemingly obvious loss of revenue, but I’ve been pointing people to Reagan’s tax reforms resulting in a revenue boost. And now I have a contemporary example in Putin, I can use it too. One thing I was wondering though, is that Hanson is proposing a 2% flat tax and abolishing our 10% Goods and Services Tax on everything we buy. My first thought was that 2% is too low and that somewhere between 10-20% would be better. I also believe that keeping the GST would further boost revenue because people would be spending more with their newfound boost to disposable income. I’m a journalist and I plan on writing about a flat tax (I have written two columns on the concept, but now with Putin and Hanson, I can unload again). Can you provide me some insight into Hanson’s ideas and if you think they’ll work? 13% is direct income tax, (witheld, btw) additional 30% are paid by the employer, and only 20% of these could be applied to employer tax base as costs. Even though flat, the system is murderous. Also, the chart of tax receipts shows correlation, not causation. 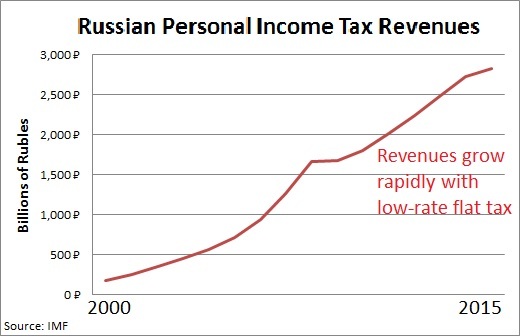 Charts of hydrocarbon prices and recent devaluation of ruble would also look correlated to rising tax receipts. The problem Mr. Devany is that I don’t want to wage war against those who have produced enough to now live the rest of their lives in luxury. I want no war either against them or their children. To me, maximizing the potential of these exceptional people is the key to a growth rate that at least matches the world average and best ensures that both me and my children remain citizens of a country that is still in the developed world past midcentury. The higher overall tax burden/revenue you advocate brings us closer to the big government welfare states of Europe, their endemic structural growth rates of one percent, their arithmetically deterministic decline. A flat tax cannot be fair or low because a flat tax is just on income. There are three tax bases: wealth, consumption, and income. In order to have the lowest rates all three must be taxed. With low rates there is no need for tax expenditures (deductions, credits, deferrals, special rates and exemptions) which distort our economic decisions and which are inherently unfair. Dan Mitchell doesn’t want low rates or fairness. He wants to tax income even though Warren Buffet, Bill Gates and Donald Trump don’t need any income to live the rest of their lives in luxury. Dan Mitchell knows successful people have lots of non-taxable economic income (i.e. capital appreciation) and relatively little taxable income. No wonder Warren Buffet doesn’t care how high the income tax rate is. Dan Mitchell fails to mention that the higher tax revenue is not coming from the flat tax but rather from substantial VAT taxes. The U.S. is the only developed country in the world without a VAT. It is certainly fair to ask Dan Mitchell if his ideal flat tax would replace payroll taxes or if he wants workers to pay double taxation on income. It is also fair to ask if Dan Mittchell supports a VAT as a necessary part of the tax revenue boost. What is missing in the Mitchell tax reform plan is a wealth tax and I certainly understand why he would oppose a soak the rich wealth tax on top of a progressive or even flat income tax. Wealth and income should be taxed inversely as the needs of each taxpayer dictate. Consider income tax rates between 8% and 28% paired with a wealth tax of 2% descending to zero. Couple this with a wealth tax exemption for up to $500,000 in savings (for health care, retirement, and education). Instead of the same rate applying to all the same income-wealth rate option would apply to all. Payroll taxes could be eliminated with a 4% VAT and a C corporation income tax rate of just 8%. Dan Mitchell is being deceptive not to mention a VAT, unfair not to consider Payroll taxation and being nearsighted not to consider the inverse taxation of wealth and income. We’ve come to the point where perhaps more truths come out of a person like Putin than from the mouth of the typical leftist western democracy politician. That is not a good sign for many developed democracies. So, once again, there’s absolutely no future in a one percent annual growth trendline. Against nations composed of voter-lemmings, even the Putins become competitive. Nations composed of voter-lemmings who are more obsessed with dividing the pie, rather than producing more pies, sooner or later have to deal with the Putins at their gates — from a position of weakness — a weakness created by the relentless compounding of economic growth deficits. So watch Europe having to deal with Putin at its gates. On a smaller scale watch Greece having to deal with Erdogan. Structural welfare state growth of one percent is a path to deterministic decline. The low growth decline pulls everything down with it, until, one way or another, you eventually cry uncle. Most nations will ride their welfare states to the bottom. So keep mobile. As the pace of everything human accelerates everything will change faster and faster. In the span of a few decades you may face once unthinkable changes — perhaps even see people emigrate to a different Russia. Brexit, Trump, they are all likely elements of the accelerating pace of change. A world that on aggregate grows by four percent annually confers a lot of rapid change, notwithstanding many of the developed world democracies comprised of voter-lemmings who are stuck in a structural one percent growth trendline, to decline.